Tina Turner’s voice is singing ‘big wheel keep on turnin‘. These words my mantra since I made the decision. I have determined to either go left or right rather than continuing to stand in the middle of an intersection. I have been working on a lengthy pros and cons list, imagining what life is like down the road going right and then again left. Envisioning possible joys, hardships, struggles, and accomplishments down each. Sacrifices and gains vary greatly but each weighted differently. All the while dodging traffic in a turbulent game of Frogger. Life is traffic. Friends and family are beeping horns,..careers and relationships are Mac freaking trucks. You take them all into consideration trying not to be flattened by any of them…feeling their pull and tug in each direction as they whiz on by. I have been playing in traffic for a while now. I don’t know how long as the time there is distorted, warped. The traffic has been noisy and congested at times. Slow and considerate, at others. All with good intentions. Beep beeps to bring my attention back to the decision at hand. Just make a choice! scream the horns. Close calls and fender benders nudging me towards their preferred direction for my life. See, that is where the struggle lies. Making the decision to go east or west, north or south based on my expectations and goals for myself and not the expectations others have of me. There is a difference. A big old difference. This is why I have been playing in traffic. For so long. I had to make sure the decision I was making was the best choice for me because of me. Not because of MAC trucks and pesky Smart Cars and mother and fathers and neices and nephews and brothers and sister in laws and bosses and coworkers and old best friends and new best friends and a city and and and and…That intersection is treacherous. An emotional game of chicken. I made it out alive and I am headed South West. Literally. And it has been my decision. Solely mine. I have made many happy, saddened a good number, put a few in a flurry, and I have a cat that hasn’t a clue what is about to happen. But ‘big wheels keep on turning‘. I am headed home. Home home. 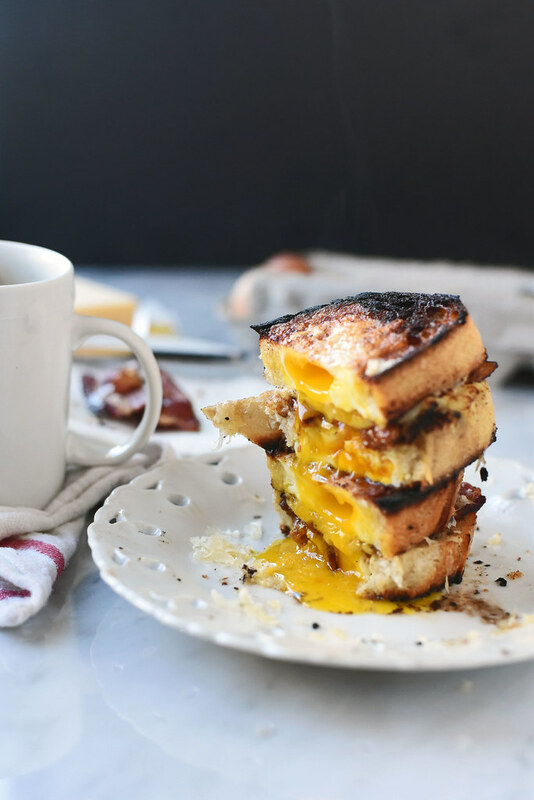 Egg in a Hole Bacon and Cheese Sandwich. I found this sandwich on the pages of Bon Appetit. It has been my main source of sustenance while I pack up my life and stack it neatly in the front room and my comfort while I say ‘until we meet again‘ to friends that have become family and a city that has become a home. 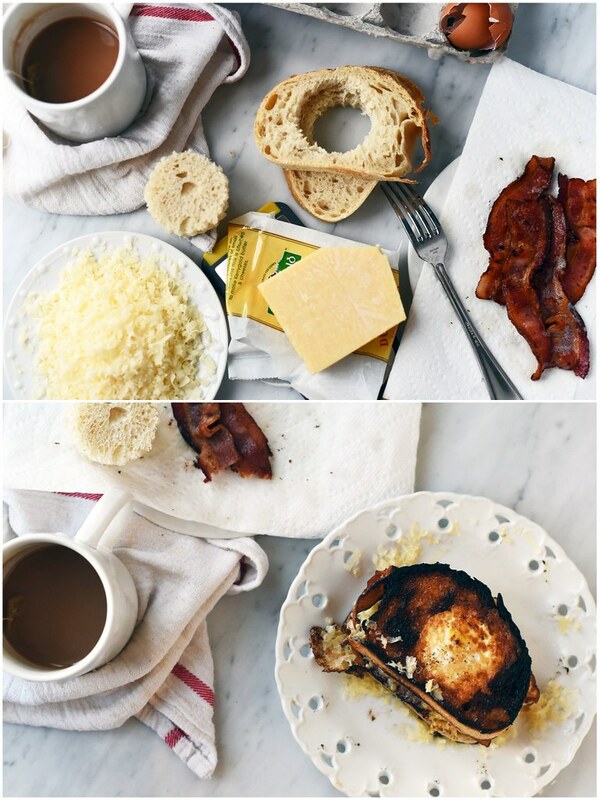 It is not nearly as difficult as farewells and comes together as quickly as a few slices of bacon can fry. The recipe below makes a single sandwich but can be multiplied to make a half dozen if you have a full table. 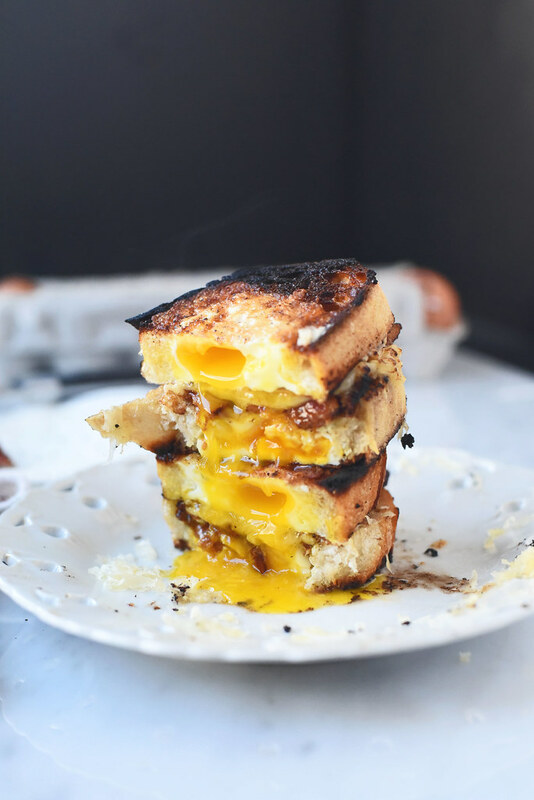 The one thing I would recommend is a towel as the egg yolk is sure to drip off your chin and cover all ten fingers by your last bite. 2 ounces sharp cheddar cheese (swiss or provolone would be great), in thin slices or grated. In a skillet (non stick was helpful but not necessary) over medium heat, cook bacon until browned and crispy. Remove from skillet and transfer to a plate lined with a piece of paper towel to soak up excess grease. Pour off about half of bacon grease into a small bowl. Add bread to skillet and cook over medium high heat until bottom side of bread is golden brown, about 3 minutes or so. 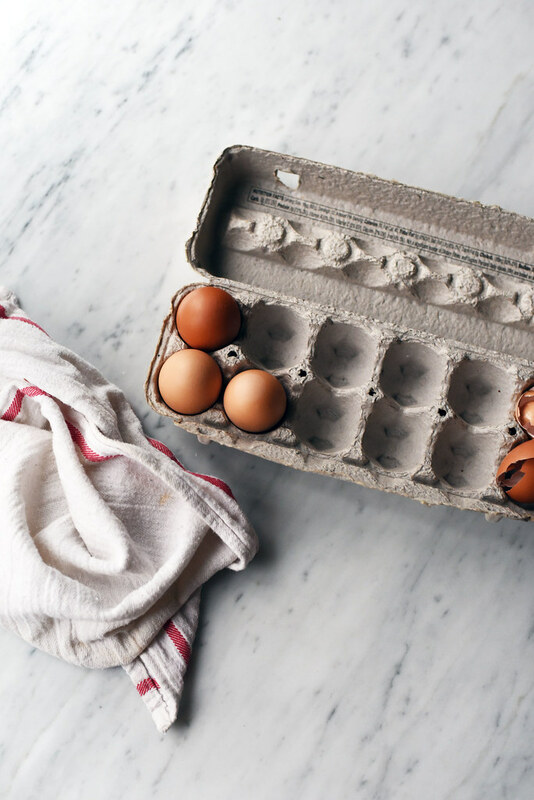 Crack an egg into each hole and sprinkle each with salt and pepper(some egg white will pool at the top and possibly squeeze out of the bottom - it is OK!) and cook until the bottom of the egg is set - about 2 minutes. Adjust heat if necessary. With a thin spatula, gently flip sandwich halves. Add 1 tablespoon of butter to pan and swirl. 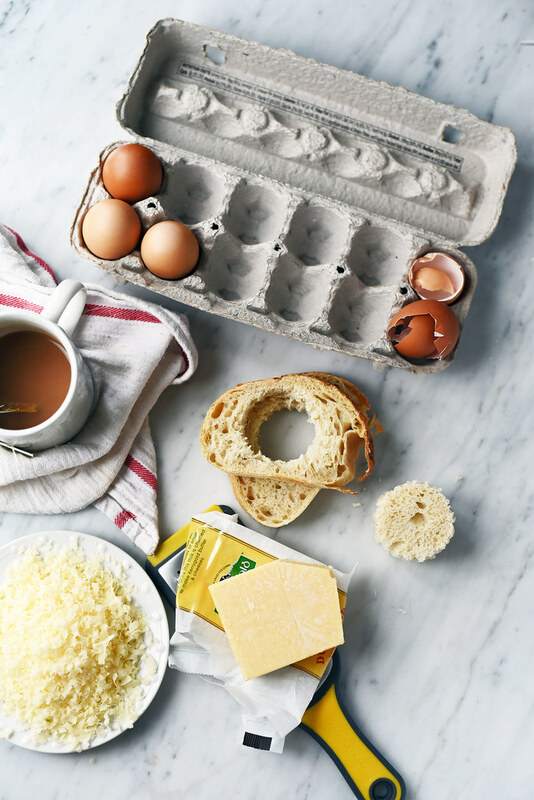 Cook this side of sandwich for an additional 1-2 minutes until egg whites are cooked through. Flip sandwich halves again and top one half of sandwich with cheese and then bacon. Remove from heat and top with remaining sandwich half. With a serrated knife, gently cut sandwich in half and enjoy!